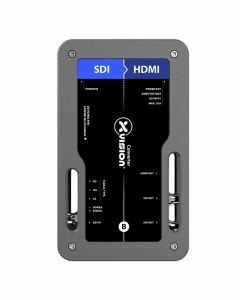 Easy conversion between profes- sional SDI and consumer HDMI with zero latency and two fully reclocked SDI looping outputs. Professional equipment in mission-critical applications is all about reliability and confidence. So xVision started with a clean sheet, and built what may soon become your most trustworthy piece of equipment. Introducing the world’s first video converters truly designed for the road. Video converters nowadays are used everywhere on profesionnal A/V events, presentations, live shows and tours and often have a critical role. Yet, they are often the weakest link in the signal chain. Low quality connectors, weak enclosure, external consumer-grade power supply, and overall barebones design that all contribute to a generally unreliable piece of equipment. xVision wanted to change that, so they designed the xVision Video Converters. Magnetic stacking system and non-skid rubber pad for table top application. Saves at least 10 gaffer tape rolls a year. Multiple mounting options : C-Clamp, wall-mount adapter, LCD mount adapter and belt adaptor. ï¿¼ï¿¼ï¿¼ï¿¼ï¿¼ï¿¼ï¿¼ï¿¼ï¿¼ï¿¼ï¿¼ï¿¼ï¿¼ï¿¼ï¿¼ï¿¼ï¿¼ï¿¼ï¿¼ï¿¼ï¿¼ï¿¼ï¿¼ï¿¼ï¿¼ï¿¼ï¿¼ï¿¼3G Format Support: 1080p50, 1080p59.94, 1080p60. SD Format Support: 525/23.98 NTSC, 525/29.97 NTSC.625/25 PAL. SDI audio Sampling: Sample rate of 48 kHz and 24 bit. SDI auto Switching: Automatically detects incoming signal format.